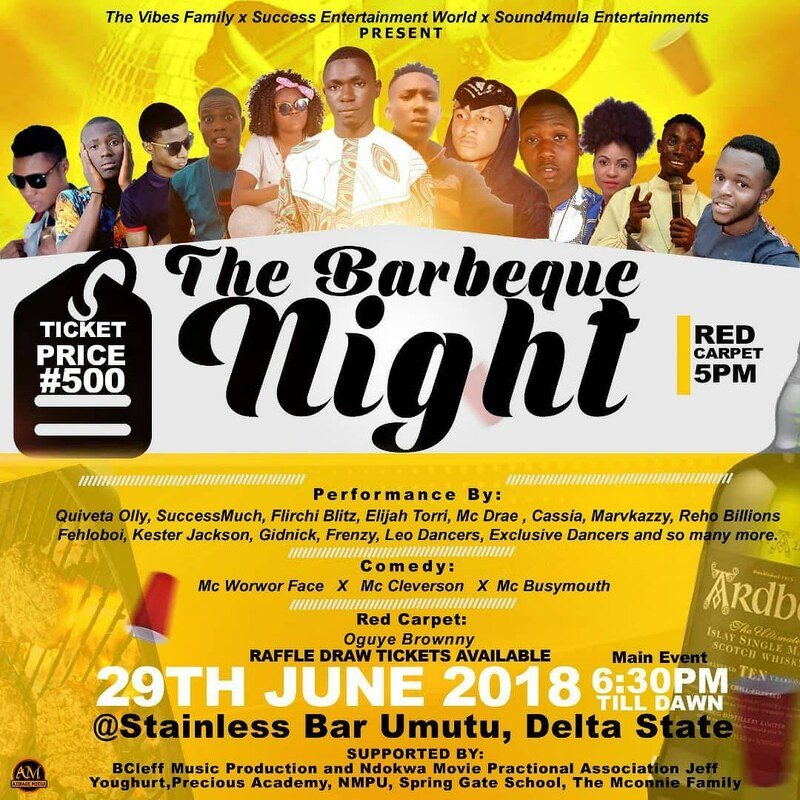 Coming up 29th June 2018, we wish to officially announce to the general public; The Vibes Family in association with Success Entertainment World and Sound4mula Entertainments presents The Barbeque Night. The show is aimed to promote young and talented artist within the selected location through a Means of get together. Nevertheless, this is our first event, we look forward to achieving greater out come than anticipated. The show will start the following performers: Cassia, Mr Drae, Quiveta Olly, SuccessMuch, Flirchi Blitz, Elijah Torri, Marvkazzy, Reho Billions, Fehloboi, Kester Jackson, Gidnick, Frenzy, Leo Dancers, Exclusive Dancers and so many more including Chidike Edmond(Vibe). The open hall event will also featuer a RAFFLE DRAW TICKETS which lucky winners get free barbeque. Tickets are limited and will be available on sales and reservation. Venue: Stainless Bar Umutu, Delta State. MAIN EVENT: 6:30PM TILL DAWN. For more information visit our inquiry page.